The much vaunted “nuclear renaissance” has not worked out as planned, with projects running many years behind schedule and hugely over budget. A major concern about nuclear power used to be safety now it is also affordability. Conventional nuclear power plants are too big, take too long to construct and are much too expensive. As a near term remedy, small modular reactors, based on well established technologies such as the PWR, look promising. Four 1650 MWe Areva EPRs, in France, Finland and China, are reasonably close to entering service, but many years later than expected. On current forecasts, the two EPRs in China, at Taishan, will be completed later this year, or early in 2018, when they will be almost five years late. The Finnish EPR at Olkiluoto will be nine years late when (if) it starts up in 2018 and the French EPR at Flamanville 3 is due to start operating in 2019, six years late, after a construction period of twelve years. These delays have led to huge project cost overruns with construction costs tripling in some cases. The Hinkley Point C EPR project in the UK has been approved, but progress has been very slow, with nuclear electricity prices turning out to be very high and funding of the project proving excruciatingly difficult. Four Toshiba–Westinghouse 1150 MWe AP1000 plants (each with two reactors) began construction over the last ten years. None is yet complete. The first AP1000 to produce electricity is expected to be at Sanmen in China, now due to be completed at the end of this year, four years late, with Haiyang close behind. The two 2 x AP1000 plants in the USA, at Vogtle and VC Summer, were due to start up in 2016-17 but have experienced major delays and huge cost overruns, resulting in the Chapter 11 bankruptcy of Westinghouse. Following project management restructuring, construction at Vogtle continues, with commercial operation of the two reactors projected for November 2021 and November 2022, respectively, while the future of Summer remains uncertain. This was not how the nuclear renaissance was supposed to playout. The performance of these projects has had a chilling effect on plans to build other nuclear reactors. Additional AP1000 projects have been cancelled in the US and commitments to new nuclear in Europe have slowed. Only in India and China are new nuclear projects being promoted. In the past, the most pressing concern about nuclear was safety. Now people are beginning to ask: Can we build affordable nuclear? The truth is dawning that the current large reactors are: too big to fund; too slow to construct; and produce electricity that is too expensive for consumers and for business. In past forty years, nuclear reactors have grown in size and in output – from typically around 500 MW in the 1970s to more than 1650 MW now. This trend has been driven by the idea of the ‘economy of scale’. The economy of scale is an idea that has a solid foundation in both the power industry and in other capital goods sectors. However, in nuclear there is no evidence that larger and larger reactors have reduced the unit capital costs. In fact, the evidence is in the opposite direction. Large economic studies of both the US and the French nuclear power programmes show that per-MW capital costs increased with size. Safety improvements and tighter regulation have played a part. The evidence is that larger nuclear reactors are more difficult to build, take longer to complete and as a result cost more. Studies in the late 1980s pointing out this relationship observed that the industry was designing reactors (then 1000 MW output) that were beyond its ability to construct in an efficient manner. As a result of their size and cost, large reactors are extremely difficult to fund. For large reactors in the West, capital costs are around £4000 to £5000 per kW, triple the expectations of the UK government ten years ago in its nuclear white paper. When interest during construction is added it means that a single reactor may require £7-12 billion of funding. Such an amount is beyond the resources of any reactor vendor, or any nuclear utility. If large reactors are to be built using private funds, they will require extraordinary forms of support and guarantees, as was the case in Finland, the USA and the UK. Current projects demonstrate that large reactors take about 8-10 years to plan and some 8-10 more years to construct. Faster construction has been seen in South Korea, where standard designs were constructed sequentially on a limited number of sites and with a stable supply chain. The Koreans have achieved builds of less than five years. But this kind of time is unlikely to be achieved in the UK, for example, where the intention is to have several different reactor designs. Power utilities used to plan for the long term, but the power market is changing. Growth in demand is not inevitable. Renewables are bringing new types of competition and utilities cannot invest in projects that may take 20 years to mature. Nuclear projects are now too slow for power utilities that have other means of producing electricity that can be developed much more quickly. Nuclear power is expensive to build although much cheaper to operate. Large power plants such as the EPRs at Hinkley Pt have 70% of their life-time energy costs linked to construction and 30% to regular fuel, waste, operations and maintenance spend. Figures for EDF’s Hinkley Point C and the follow-on station at Sizewell suggest electricity prices of about £100/MWh in today’s money. The price of power from renewables is falling to the point where this is beginning to look uncompetitive, while nuclear costs seem to rise inexorably. Crucially, the costs of both nuclear and renewables are well above those for new gas plants, which set consumer and business expectations for the cost of electricity. Consumers may be willing to pay a small premium for dispatchable low-carbon energy, but not the 50%, or more that is being sought. To be successful, low carbon energy sources, including nuclear, will have to reduce their power prices to below about £65/MWh. The question is: how? go for small modular reactors based on light reactor technology but designed for construction in numbers in factories. South Korea has shown the way in building a series of 900 and 1000 MW reactors of a standard design derived from a design licensed from Combustion Engineering. Since 1995, they have built a dozen of these CE-derived reactors in a consistent and regular manner, using the same elements in the supply chain. They learned from the experience of Japan, applying modern construction methods to nuclear – full CAD design, open-top construction, modularisation, and skills development. In this way, they have minimised (though not eliminated) design change, made their factories more efficient and crucially improved site productivity by learning lessons from one project and applying them to the next project. The results are clear. They have reduced the construction time from 6.5 years to 5.5 years and reduced capital costs by about 30% (see Figure 1). Some claim that these levels of cost apply only in the culture of East Asia. A recent re-appraisal of the US build programme in 1980s by Ganda (ICAPP 2016) dispels this viewpoint (see Figure 2). It is based on detailed data collected regularly for the EEDB (Energy Economic Database). This demonstrates that the most important costs for nuclear construction are not the high technology vessel and turbine manufacturing costs, but the site construction work and its associated design and supervision overheads. The complexity of nuclear construction is not in the primary systems, but in the detailed design and building of concrete structures, mechanical equipment and electrical systems. Though this equipment and these systems look superficially like any other power plant, the size, the complexity and the quality standards mark out nuclear construction. As a result, site costs are very high and variable and reflect the inherent low productivity of site work. Nuclear site labour and site indirect costs are often around 50% of the total project cost and are higher when a project takes more time to finish. Using standard designs of reactors allows part of the site costs either to be eliminated or to be reduced substantially over the course of a programme of build. The initial costs of licensing and establishing a local supply chain are focused on the first project. Much of the repeated detailed design, which occurs whenever the supply chain is changed, is eliminated. We can see from the French experience that learning between projects is most effective on a single site. However, when projects run for 8-10 years and when new sites are developed, learning between projects is greatly reduced. However, the scope for site related cost reduction through standardisation is clear. Ganda reviews best practice in the US and shows that the construction cost of similar plants was 45% lower than the average, with the main contributors being reduced site overheads and lower owner’s costs. These reductions mount as the size of the programme increases and are amplified by the lower interest during construction arising from more rapid builds. New reactor design has flowered in the last ten years, led by small entrepreneurial teams mostly funded by private individuals or venture capitalists. These start-ups are seeking to make nuclear cost effective in combating climate change while avoiding the innate conservatism of the nuclear industry. They are proposing smaller and simpler designs based on advanced technology. There are over 50 such designs at various stages of development around the world, with most using “Generation IV” reactor technologies – featuring liquid metal-cooled, high temperature gas and molten salt systems. embody inherent or walk-away safety concepts, which either make them safer than current designs, or provide comparable levels of safety, more simply and with lower cost. All are at the concept design stage, though some are starting the process of assessment by national nuclear safety regulators. The EIRP comparative cost analysis uses the companies’ estimates and puts them on a common footing, linked to detailed cost definitions. In this way, they can be compared both with each other and with a baseline large PWR. The cost comparison is shown in Figure 3. All the new reactor capital costs are lower than the reference case, with values ranging between just over $2000/ kW to almost $6000/kW, compared with the baseline LWR figure of $6755/kW. It is worth noting the low level of indirect cost (overheads) in all the new reactor estimates compared with the baseline PWR ($2400/kW). Low capital costs are matched by similarly low electricity costs, with a mean of $60/MWh (LCoE) compared with the conventional reactor’s $100/MWh. Where these designs are small in size, they may also benefit from more factory manufacture, potentially reducing costs, improving quality and improving schedule certainty. Also, it is recognised that some designs have features which may increase capital costs. Smaller units may be more expensive, as may those, such as gas reactors, with a lower power density. 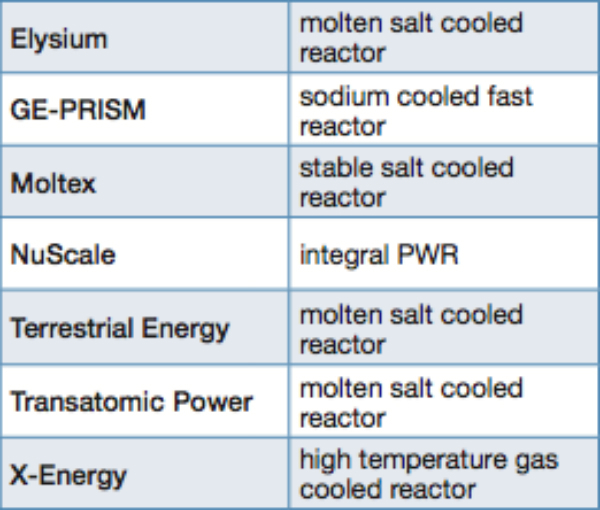 Additional chemical and fuel processing for PRISM and the molten salt reactors may also increase costs. A key issue for these new designs is uncertainty. Until a prototype reactor is built and has been operated successfully for a number of years, there will remain questions about the cost estimates. Also, there is no large-scale funding available in either the USA or Europe to test out these designs. This lack of political drive together with the conservatism of safety regulators will mean designs incorporating new technology will not be available for commercial deployment for at least another decade and perhaps much longer. The key idea behind small modular reactors (SMR) is using modular design to transfer much of the complex construction work from site to factory conditions. In factories, productivity is much higher, tools and jigs can be deployed to improve both constructability and quality. Also, the higher numbers of SMRs required to produce a given amount of power (compared with conventional large reactors) can be concentrated in a single supply chain, allowing the ‘economies of multiples’ to progressively bring down costs. Modular construction is not new. It is widely used in other construction sectors and it has been attempted in nuclear. 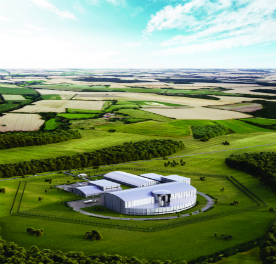 For its ABWR projects, for example, Hitachi has constructed large modules close to site. As part of a wider design and construction strategy, it has enabled cost reduction and timescale compression. Building on earlier studies of modularisation by Stone & Webster for the US Department of Energy, Westinghouse has used modular methods for its AP1000, but this has not worked out well. Design delays and quality problems have led to cost increases. One can see that these large reactors are too big to break down into modules for transport by road and large barges are required to carry the ~200 t modules. However, if designed with smaller modules, they become so small that little of the work is done in factory conditions. Much of the construction work is done close to site, to create mega-modules of 300-600 t, which are then lifted into their final position. Also, in adopting modularisation it is important to use contractors and suppliers that are knowledgeable about modular design methods and can work to the closer tolerances and higher quality standards that are required for success. The economic opportunity for SMRs is driven by four factors: power scaling; standardisation; modular build; and production learning. These drivers will affect different components of the capital cost in different ways. Though power scaling, where unit costs fall as power increases (and vice versa), seems not work in nuclear at the overall plant level, it can be expected to apply to fully designed and engineered equipment, such as reactor vessels and turbines. As explained earlier, standardisation of the design removes the need to repeat design work and leads to progressively reduced costs, at the expense of much more detailed design and construction development for the whole power plant. Standardisation is the precursor for successful modularisation and production learning. Modularisation provides a step-change in productivity. This is recognised in both ship building and in chemical plant construction. It has also been demonstrated in the construction of nuclear submarines. Design for modular build and assembly is also key to achieving the short build periods that are claimed by SMR designers. Production learning is routine in other industrial sectors where costs fall progressively with increased volume of manufacture. It is also present in most other energy sectors. It is the reason behind the falling costs of competitors to nuclear such as wind turbines. Why does it not occur in nuclear? The reasons are simple. Nuclear projects are marred by frequent design change. Supply chains are changed often, losing the benefits of experience. The frequency of nuclear production is too low for learning to be captured and transferred. SMRs provide the opportunity to address all these issues. They can be standardised, modularised and could have the volume to drive production learning. But there is no certainty about these things. If SMRs are the wrong size, are not standardised or designed for modular construction, or are built in ‘penny numbers’ with constantly changing supply chains, they will cost even more than their large reactor cousins. This is why the SMR project is about developing a new way of making nuclear reactors rather than the pursuit of new technology. Applying these factors to SMRs for a range of sizes and programme sizes – as shown in Figure 4 – we can see the effect of the cost drivers. An SMR of about 300 MW in a large programme (more than 10 GW) could achieve electricity prices close to £65/MWh, resulting from its lower capital costs and shorter construction times. At these price levels, nuclear power would be competitive with new CCGT in the UK, for example. There are a number of ways that nuclear could again become competitive and attractive for governments and investors. Large reactors need the stability of large and consistent build programmes and standardisation of the design and the supply chain. New technology reactors need prototypes to prove their undoubted potential, and to show they have no technical problems and that their cost estimates are sound. SMRs using current reactor technology (for example PWR-based, as proposed by Rolls-Royce, Figure 5) are a more near term way of achieving the lower costs and short build times that are required for nuclear expansion. SMRs also need consistency of design and the scale of nuclear power programme to allow cost to be reduced and therefore to be really competitive. Tony Roulstone established and teaches on the nuclear energy masters programme at the University of Cambridge, UK, with research interests in the economics and safety of nuclear power. Previously, he was MD of Rolls-Royce Nuclear.